COLUMBIA, S.C. — The Gamecocks caught a big fish for their 2020 recruiting class. Today they landed one of the top receivers out of North Carolina. 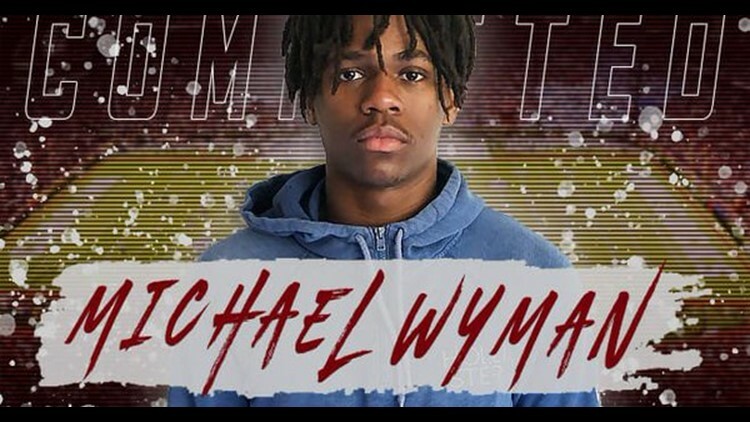 Mike Wyman, a four star wide receiver from Dudley High School in Greensboro, North Carolina announced his commitment to the Gamecocks around 4:30 pm on Tuesday. The 6'4", 197 pound receiver chose USC over 43 offers. Auburn, Florida, Georgia and Oklahoma were among those in the mix. South Carolina head coach Will Muchamp and his staff beat out some SEC East rivals to get a receiver who is ranked as a top 10 prospect in the entire state of North Carolina by Rivals. Muschamp and offensive coordinator Bryan McClendon were on Wyman early and it paid off. "You know Coach Muschamp and Coach B-Mac they've been recruiting me since day one. There were one of first offers and have shown nothing but love," Wyman said after announcing his decision. Wyman also mentioned the style offense USC runs that will help his transition. "They kind of run a similar style of offense that we run here so that will be easy coming from high school to college. That's one of the things I looked at, what kind of offense they ran so that played a big role in it as well. Wyman is now the 6th commit in the 2020 class which also includes North Carolina receiver and USC commit Da'Qon Stewart. More talented depth coming at the wideout position next year and it's needed given that Bryan Edwards is entering his senior year at USC.